We had to get up at 6:00 and had to have our bags outside our door at 6:45. We ate our buffet breakfast in the hotel and were on the bus at 8:00. 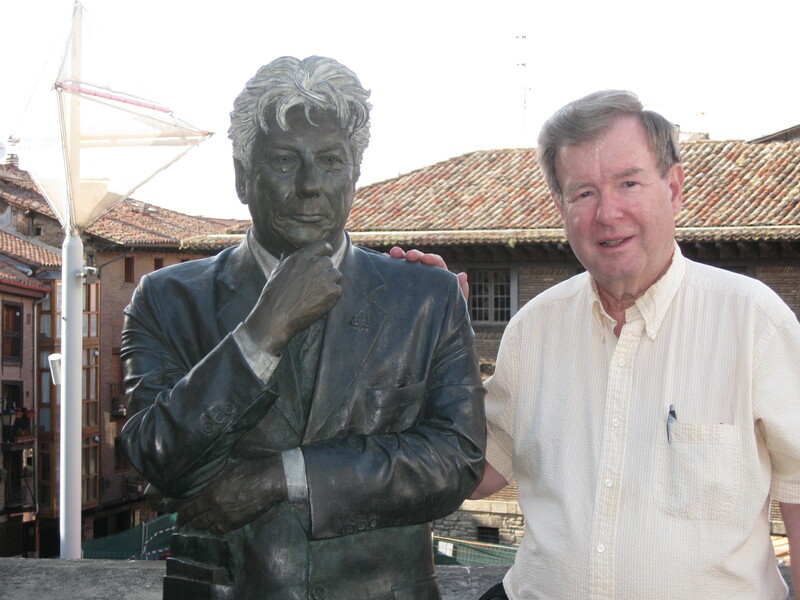 Our first stop was at Segovia, which is 57 miles NW of Madrid. 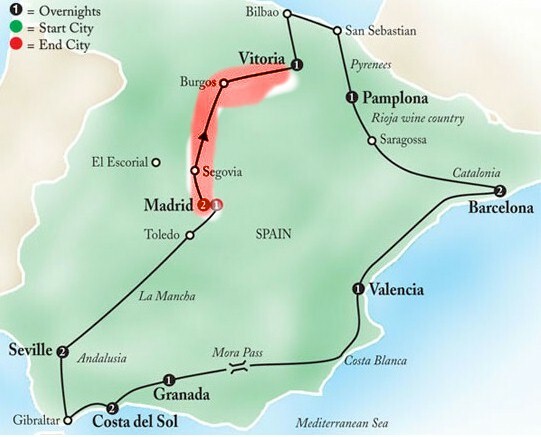 Segovia is on the slope of the Guadarrama Mountains, where the Eresma and Clamores rivers converge. This ancient city stands in the center of the most castle-rich part of Castile. Isabella herself was proclaimed queen of Castile here in 1474. We were allowed 45 minutes. Kaye said it would take 20 minutes of fast walking to get to the Cathedral. I had really wanted to see this cathedral, but the bathroom break always comes first. There was a visitor’s center which had rest rooms but it wasn’t open until 10:00…in 15 minutes from our arrival. We found a café, but you always need to buy something to eat or drink in order to use their bathroom. This is sort of an endless cycle because after you have the drink you have to soon go again to the bathroom. So we got some coffee and by the time we finished and used the facilities it was almost time to get back on the bus so we didn’t have time to walk to the cathedral. This was one of the great disappointments of the whole trip. I complained to Kaye. She said that they used to see a lot more cathedrals on this tour, but people complained that “once you seen one, you have seen them all.” This is an attitude that I have tried to diminish because I believe that every cathedral is very different from the last one. 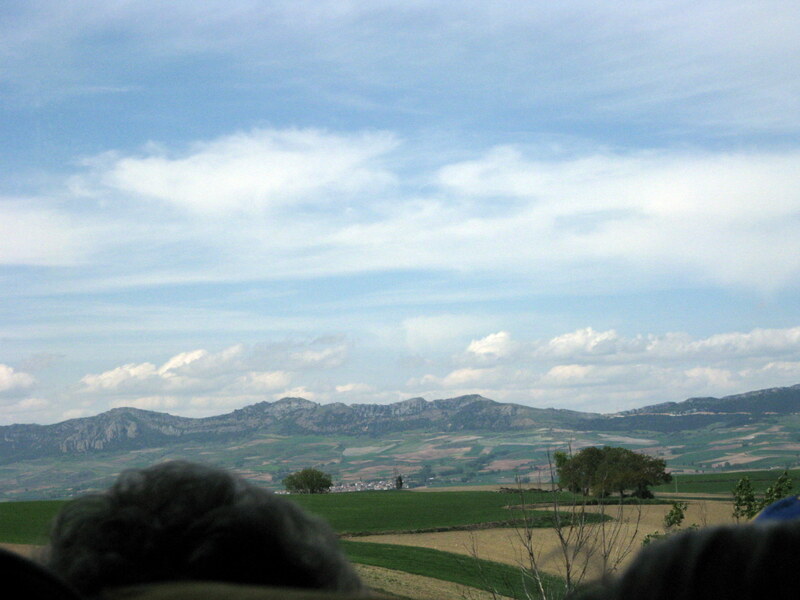 The picture above was taken from a moving bus using my zoom lens. 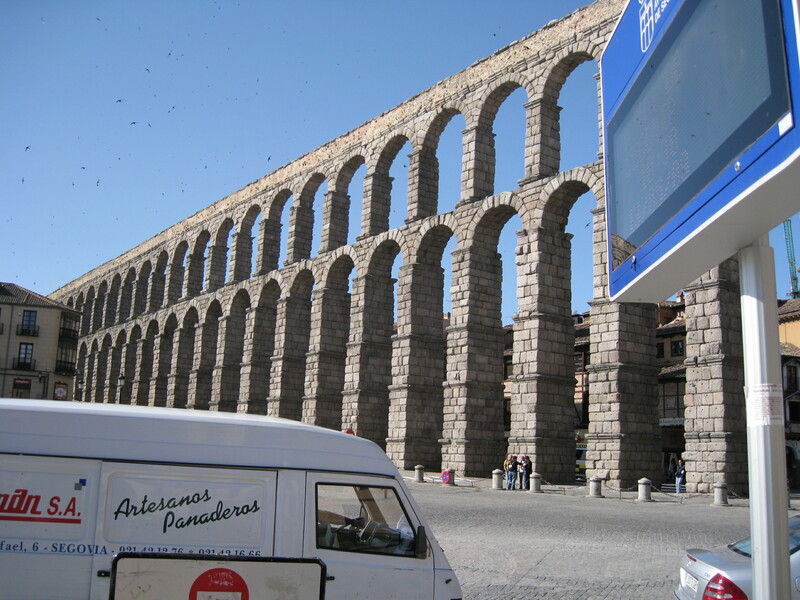 Segovia is also famous for its Roman Aqueduct. The bus had parked almost under it. This architectural marvel was built by the Romans nearly 2,000 years ago. Constructed of mortarless granite, it consists of 118 arches, and in one two-tiered section it soars 95 ft. to its highest point. When the Moors took Segovia in 1072, they destroyed 36 arches, which were later rebuilt under Ferdinand and Isabella in 1484. We got back on th e bus and it was announced that we would have another rest stop in about an hour, but first we would arrive in Burgos in about 45 minutes. We were allowed 45 minutes to see the cathedral and all of Burgos. It was a beautiful walk across a bridge over the river to the city gate. 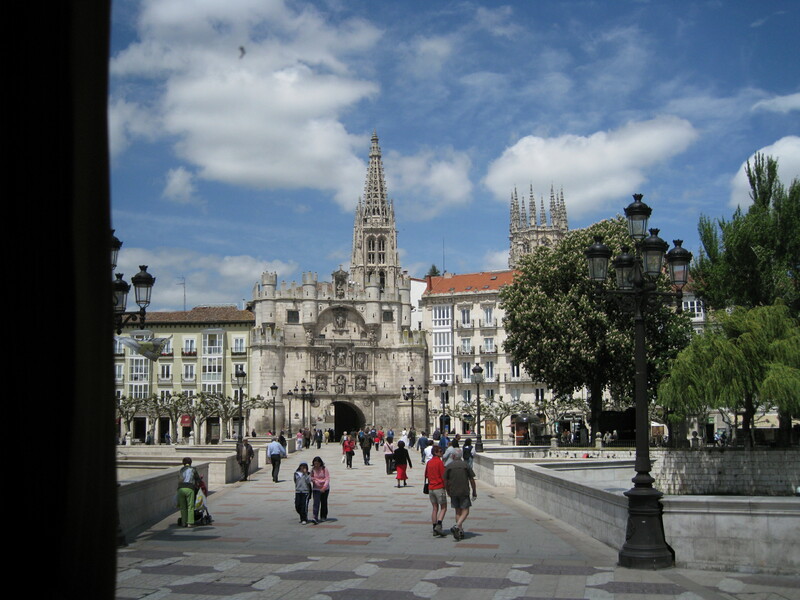 This Gothic city founded in the 9th century is known as the "Cradle of Castile." El Cid Campeador, Spain's greatest national hero, immortalized in the epic El Cantar de Mío Cid, was born near here and is buried in the cathedral. 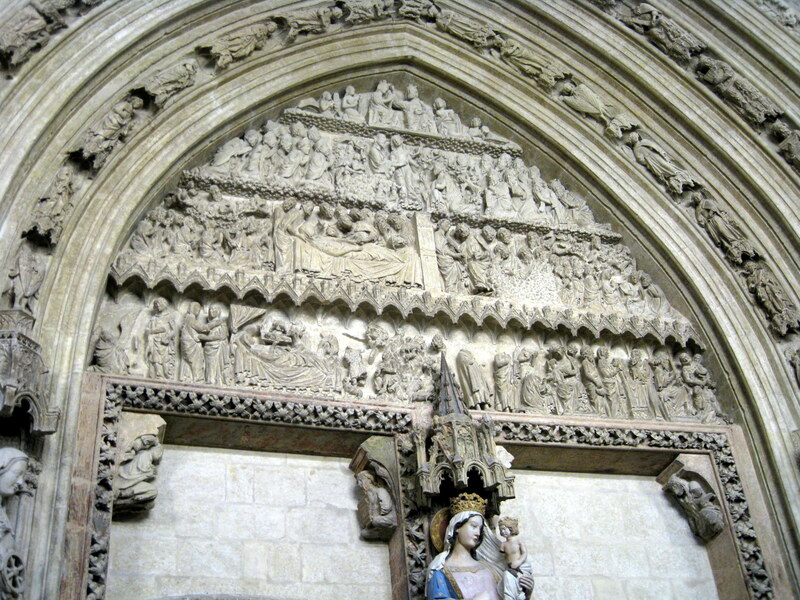 Inside the gate of Burgos was the beautiful and large Gothic Cathedral of Santa Maria. It was begun in 1221. It is built in diverse styles, but predominantly Flamboyant Gothic. It took 300 years to complete. Kaye had played down the interior of the cathedral which was unfortunate because only my wife and I and another couple went inside. There was an admission charge. Photography was allowed. 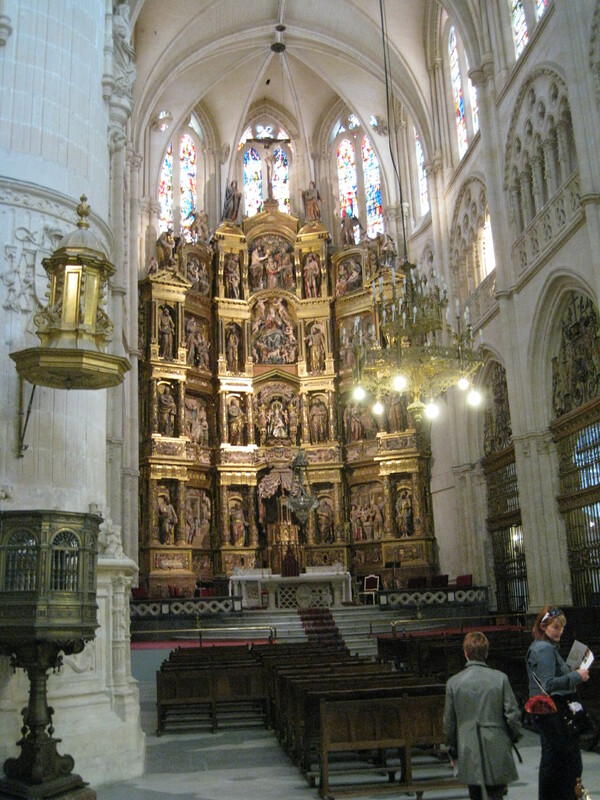 This was our first experience with Spanish Cathedrals. Unlike Gothic Cathedrals in other countries, we found – this being the first example- that there is no unobstructed center aisle in the nave leading from the entrance to the high altar. See floor plan on the left. There is space, when entering the west door, and then a large enclosed area which is the choir. To enter the choir, there is sometimes a small door or the choir is entered from the middle of the nave. 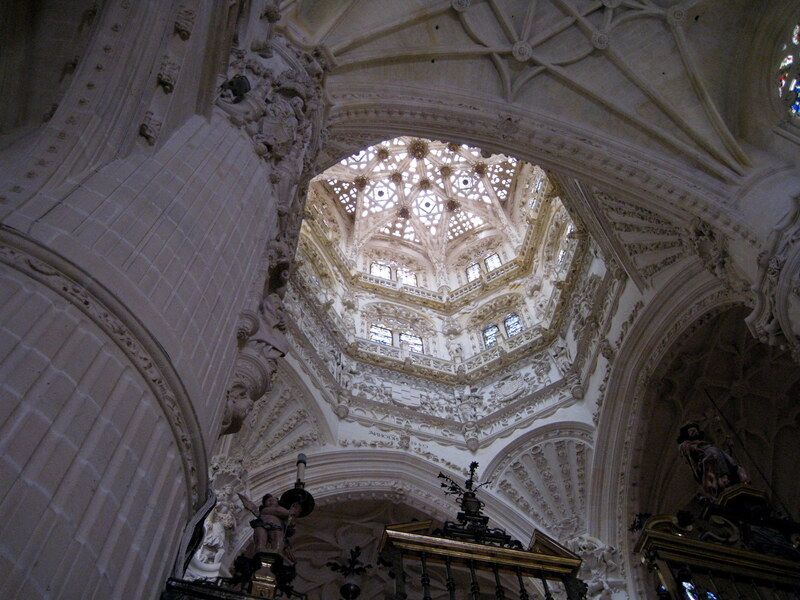 In Burgos cathedral there is a huge octagonal lanternlike dome at the crossing. 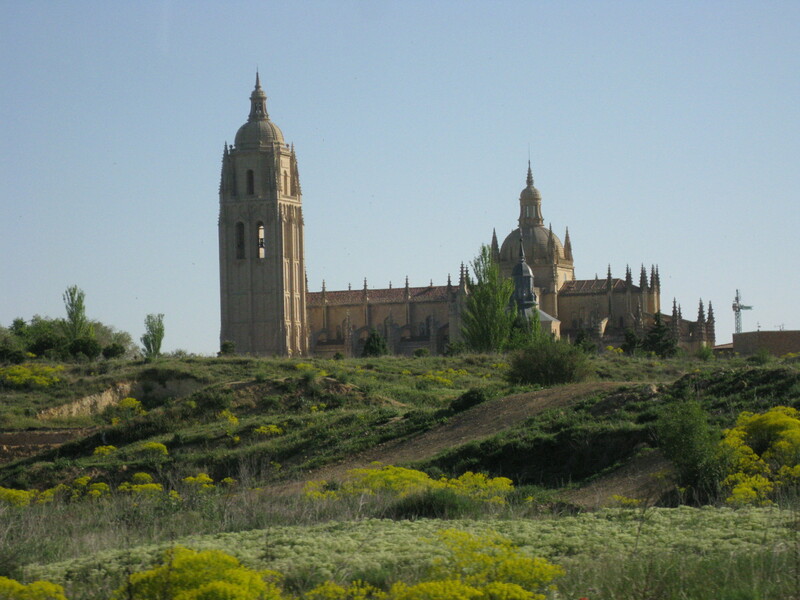 Under the dome are the remains of El Cid and his wife, Dona Ximena. 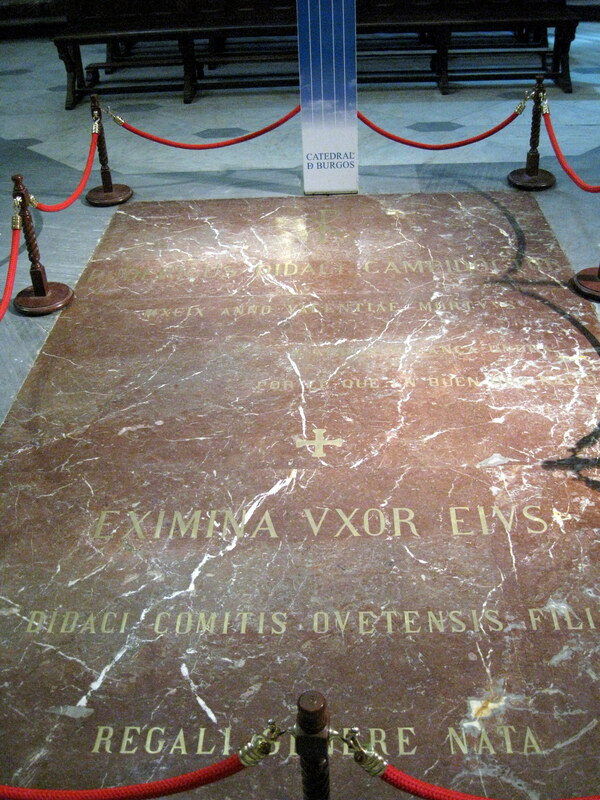 A large marker on the floor marks the tomb. 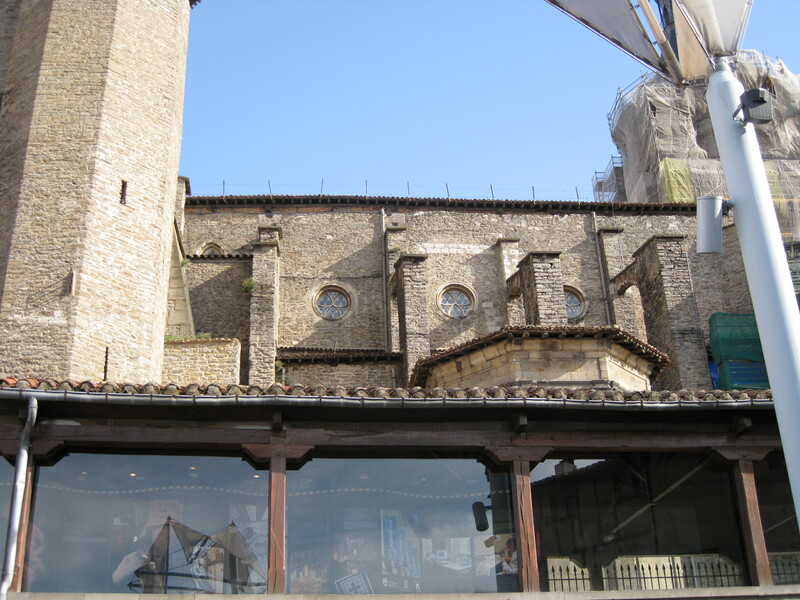 On the west side is the choir and after the space of the crossing and the tower, there is on the east side of the cathedral with the main altar. 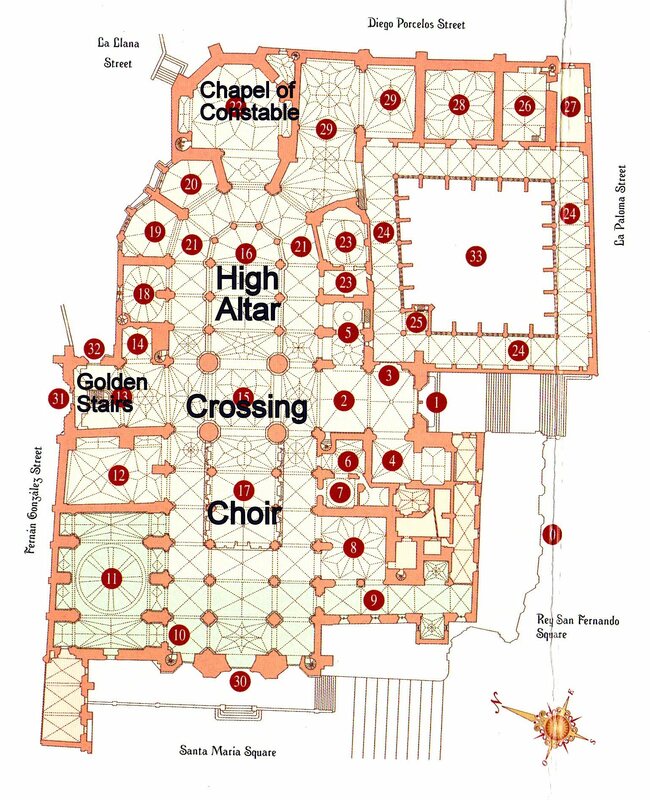 Unlike the Washington Cathedral or other cathedrals that we have visited in other countries there is no large open area known as a nave where the congregation sits. There are side aisles in the nave with chapels and an ambulatory in the apse. 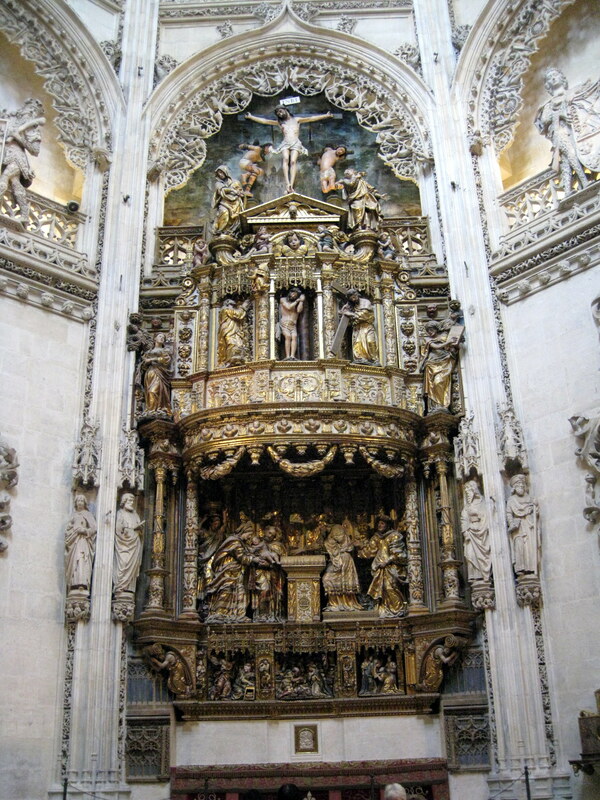 The 16th-century Chapel of Constable, behind the main altar, is one of the best examples of Isabelline-Gothic architecture, richly decorated with heraldic emblems, a sculptured filigree doorway, figures of apostles and saints, balconies, and an eight-sided star stained-glass window. On the south side of the church was the Golden Stairway which was quite lovely. There wasn’t enough time to really take in all of this wonderful cathedral. We did find a small religious store outside and bought a book. Again this is a disadvantage of a tour…you have to go when the bus goes! Back on the bus, for our promised rest stop at a roadside restaurant. By this time it was 3:00 pm. I had a hamburger, French fries and a dessert and my wife had a chicken sandwich and rice pudding. We were now driving north now. The scenery got rather mountainous the further north we went. Our next stop, which was for the night, was Vitoria. We were now in Basque country. We were dropped off in front of our hotel, The Barcelo Gasteiz. This was our first experience at arriving at a new hotel. We would always go into the lobby. Kaye would go to the desk and pick up our room keys which they had waiting for us. She would call our names and we would get our key. Our luggage was always delivered to our room. Vitoria was chosen as headquarters of the Basque region's autonomous government and revived the name Gasteiz, by which it was known when founded in 1181 by King Sancho of Navarre. The name Gasteiz is much preferred over the name, Vitoria, a battle site revered by the English. On June 21, 1813, Wellington vanquished the occupying forces of Napoleon. 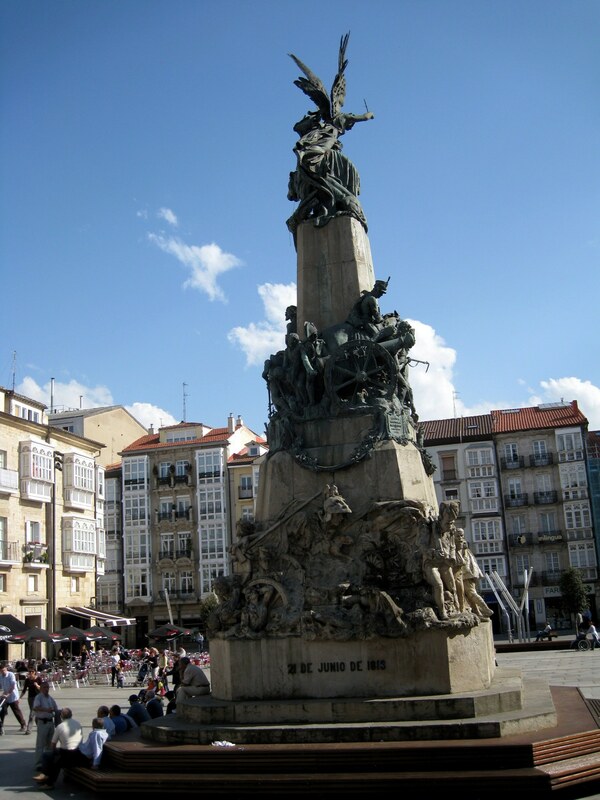 A statue dedicated to the Iron Duke stands today on the neoclassical Plaza de la Virgen Blanca. We were told about how to visit the old part of the town which wasn’t far from our hotel. There was no organized tour. We passed the new cathedral, but work was being done on the front and it was not opened. We wanted to see the old cathedral. We stopped in the tourist office and ask for directions. We knew it was being restored and that admission was only by advanced reservations. We asked about a reservation and the lady at the desk called and got us one for an English tour at 6:45 pm. We started walking through the old area. 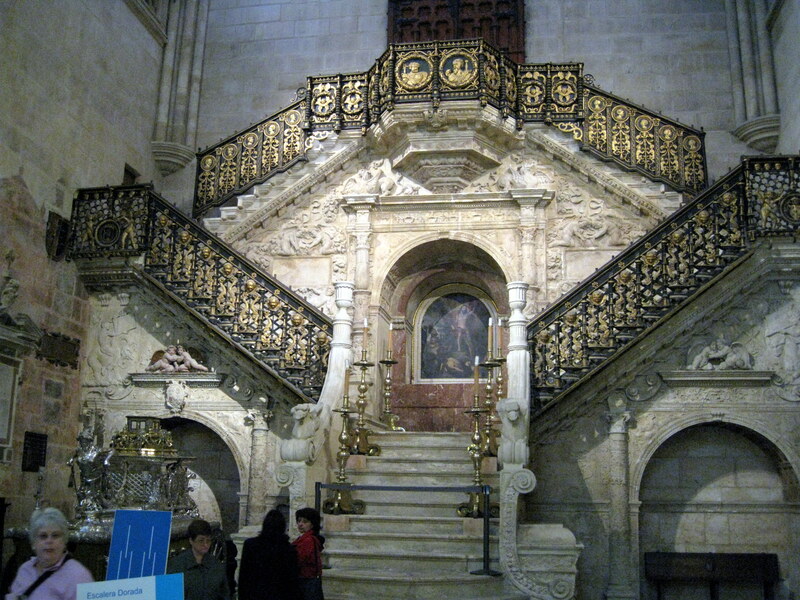 We climbed a number of steps until we arrived at the Vitoria cathedral. There was a reception area where we signed in. 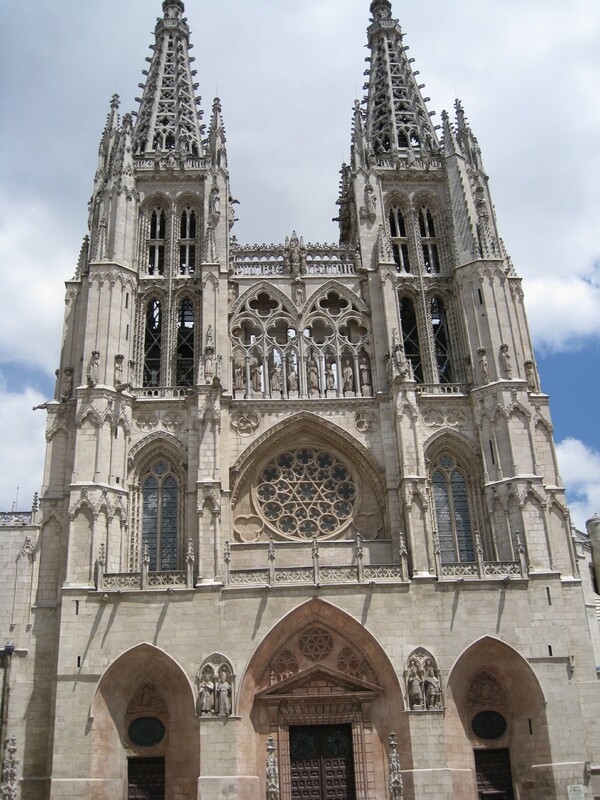 The cathedral was built in the 14th century in the Gothic style. 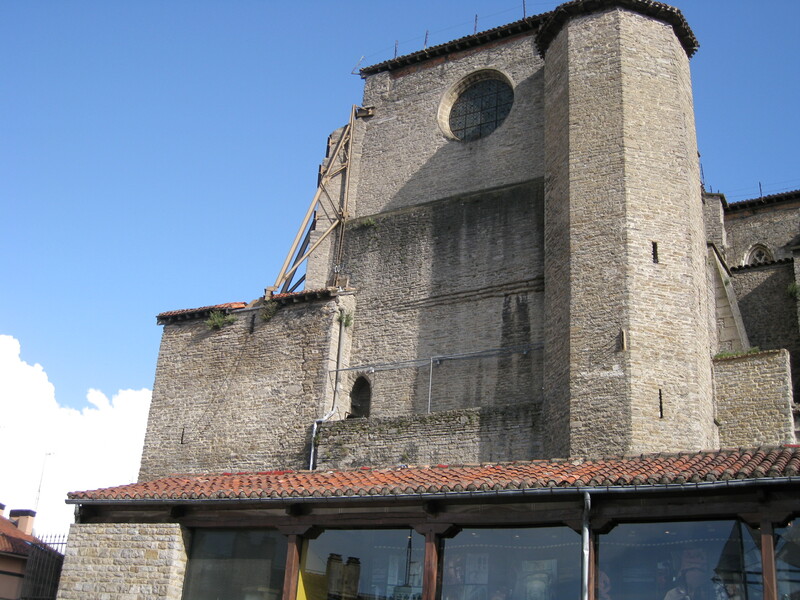 In the late 1990 it developed several structural problems and was closed to the public and restoration started. What is being done now in Vitoria is unique in the world. An ancient gothic cathedral is being “built”. All Europe is watching. We got on an English speaking tour consisting of 9 people – 3 men in suits, who were not English, but could understand it, a couple from Japan and a young couple for California. We viewed a five minute video of the plans for restoration. Then each of us was given a hair net and a white hard hat. We were not allowed to take interior photos. The inside floor had been completely removed and replaced with temporary work ramps. We could see how the walls were bowed. We then climbed many steps to the Triforium level of the Apse. It was too high for my wife so she had to stop on the way. It was quite an experience being up so high and looking at all the structural problems. It seems that at some period in history a wall or screen was placed in front of the choir which blocked some of the view. Sometime in the last century they decided to take it down. That is when the problems began. In order to avoid the steps, we consulted our maps and went back to the hotel a different route. We got back just in time for dinner. Dinner was served in the hotel. There was a large room where people were seated at tables for four and one smaller room with one table that seated 16. We were in that room. We had a very good veggie soup, sole fish and potatoes and a cheese cake type of dessert. Part of the fun is not knowing exactly what you are eating. We ordered a bottle of wine, as other people did. That was extra, but very reasonable. After dinner we went back to our rooms. We learned later that several people had money and credit cards stolen out of their room while they were at dinner. We were advised to keep our valuables in the room safe or carry them with us. We always use hotel room safes and only carry one credit card and very little cash when we are on the street. I offer some practical suggestion about travel security at the bottom of Day 10.